We are a friendly group of rug makers who meet on the second Saturday of each month (except August) at the Bradford Industrial Museum. We met on the top floor of the museum in the Education room. Access is by lift. Scroll down for more details of our group. Please note our formal meetings start at 1.30 pm, but you can arrive from 12 noon and sit and mat. Our group aims to both preserve and promote hand rug making. We use a variety of techniques including hooking and proddy, latch and locker hooking, knitting and crochet. 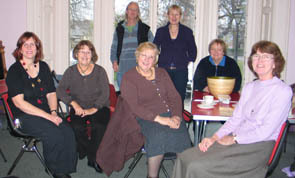 We are a lively group with a few new members each month, and welcome new members. We are not a substitute for a days workshop, more a group of like minded individuals who like to share good practise and work together to develop our skills. 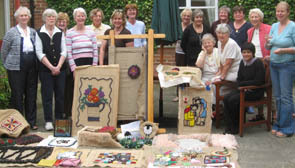 Our meetings are a mixture of talks, short workshops, “sit and mat” and community projects, as well as a Show and Tell each month when Members share their completed rugs with the rest of the group. It is the photos from the show and tell sessions that appear on the monthly web pages. If you are interested in joining us please browse some of the monthly meeting pages to get a flavour of our work. We produce a emailed newsletter each month, both to document our activities, and also to remind members what to bring to the next meeting. If you want to join us it is a good idea to email us first via our contacts page please, so that we can tell you an appropriate meeting to attend. A new venture for us is to put on our web page our meeting programme. So please look and see what we have planned for the next few months. (Sometimes the scheduled event may need to be cancelled or rearranged due to ill health and we can take no responsibility for this occuring) and we also try and retain a certain amount of flexibility so that we can respond to new interests/ events. We also often contribute to a group project, such as the bunting above.We ask that members have an input into these projects, according to their skill levels. A christmas small “rug” secret santa.. In addition once a year we have a a weekend of rug making at Cober Hill Hotel outside Scarborough. Annual membership for is £12. New members can pay for one meeting £2 before deciding to join us. Membership includes an emailed monthly newsletter. If you are interested in joining us please come along to one of the meetings or use the contact page to get in touch with us.